Image: “wade, james” by Gabriel Li is licensed under CC BY-NC-ND 2.0. Well, another NBA regular season has come and gone — and unfortunately, so has two amazing legends in the sport. Just as Kobe Bryant, Steve Nash, Jason Kidd, Allen Iverson and so many other legends have retired in the past, we have lost two more to retirement — and this time it’s Dallas Mavericks legend Dirk Nowitzki and Miami Heat legend Dwayne Wade. This past week, the world saw two historic careers end in losses, but in the end, each legend put up a great game in their final appearance on the court. This past Wednesday, Nowitzki and Wade saw matchups against two playoff teams in the Brooklyn Nets and the ever-looming San Antonio Spurs. As Wade went off in Brooklyn, posting a triple double in front of his best friends in LeBron James, Chris Paul and Carmelo Anthony, Dirk posted a solid 20 points and 10 rebounds in his 32 minutes of play. His family and friends from his home country of Germany and from around the world watched as number 41 played in his final game of his 21 season. Before each game, both players saw tributes, whether it was from their own teams just days before, or as in Nowitzki’s case, a video from the rival to their south in San Antonio, where the Spurs Organization moved the seven-foot German Power forward to tears on Wednesday night. 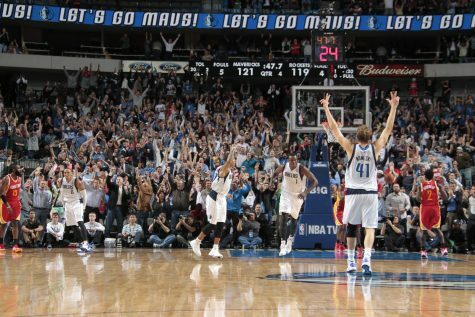 This video shocked not only Nowitzki, but fans and reporters watching. Meanwhile, beer company Budweiser also shocked the NBA world and Wade, tricking him into thinking he was going to swap jerseys with fans, but in reality, it was people who he made an impact on who came forward, nearly moving Wade to tears. I think these next couple of years will see a true end to the era of old, as more and more older veteran players retire and leave the league. Dirk Nowitzki retires as one of the all-time greats to ever play basketball. He put on one of the classic finals performances when he took down the “Big 3” in Miami. Dirk is also the sixth place all-time scorer. 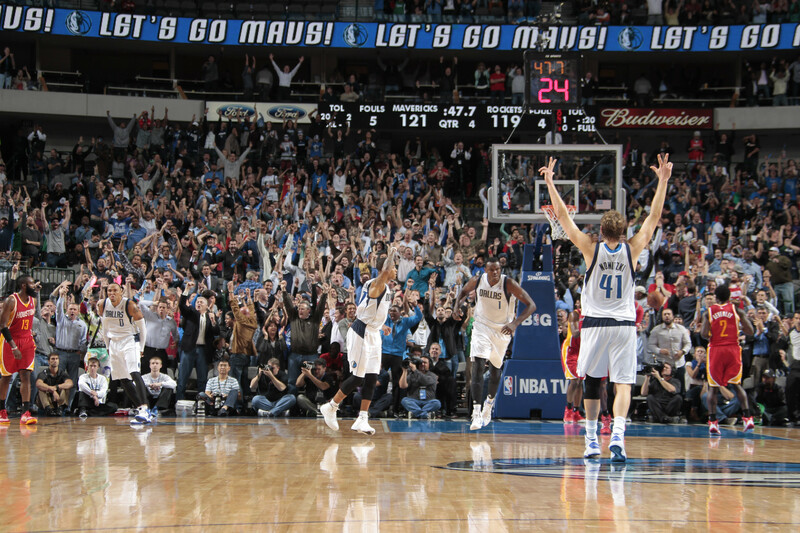 “Houston Rockets v Dallas Mavericks” by Danny Bollinger is licensed under CC BY 2.0. 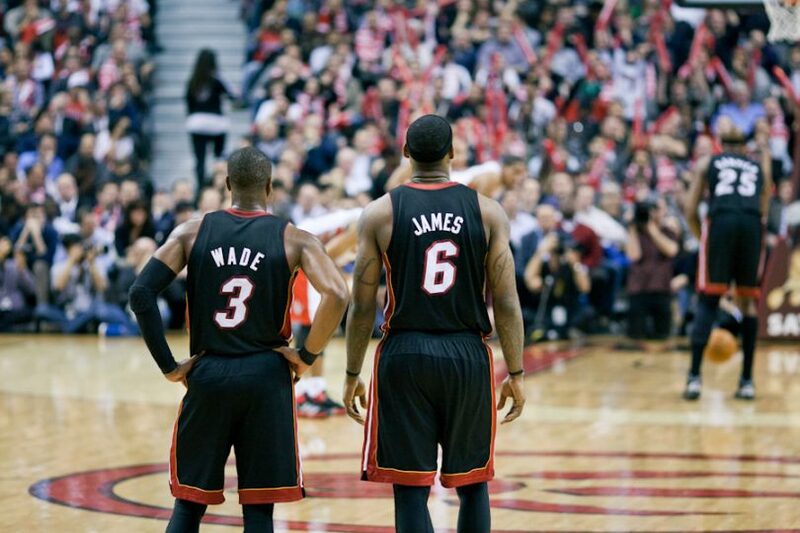 For us NBA fans of past players, seeing legends like Wade and Nowitzki retire mirror when our fathers saw legends of their time retire, like Larry Bird or Magic Johnson. As time continues to evolve and shape the league into new heights, new legends will be born. Ultimately, this will just continue on to our sons and daughters who look up to future legends who are just rookies and two year players now, or not even in the league yet today. But, it still hurts to see legends of each generation retire and move on from the sport that made them into such star-caliber athletes. I know all NBA fans out there will see the coming retirement of Lebron James as a true end of the 2000s eras of basketball, considering Wade and Nowitzki just retired, leaving only Tony Parker and James remaining from that time. As new players enter the league and the old generation fades into time, we’ll see the legacy of players like Dirk and Wade be immortalized into their respective franchises history. As Mavericks owner Mark Cuban stated in Nowitzki’s postgame retirement ceremony on April 9, “I’ll promise you that you have a job for life, I don’t care what you do.” Cuban also later promised that he’d retire his number and put a statue outside American Airlines Center, where the Mavericks play. This may be a sad moment to see two legends fade into history, but ultimately, this just sets up the future of the NBA and cements the greater legacy of the past.